My mother and father loved the hounds and as a result of their love agreed to adopt a retired show dog from Paul Nelson of Santana Bassets in 1955. Bayard was 4 at the time and Paul felt he deserved a happy home life following his retirement. Bayard was red and white with beautiful conformation, movement and an outstanding temperament. He was a true ambassador of the breed. Bayard and I went everywhere together. He would help me train for tennis tournaments by doing wind sprints. Of course, he was much better at it than I was! Needless to say, I fell madly in love with the breed. 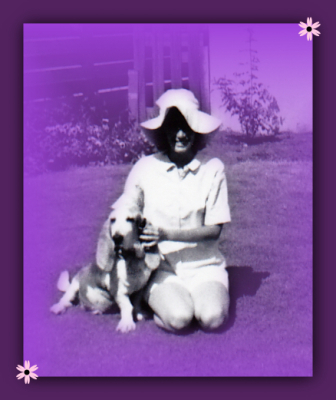 I felt in my heart that a Basset Hound would always be a part of my family. The companionship and temperament of this dog was incredible and his antics made me laugh. When I was down he continually uplifted my spirits. While attending UCLA, Bayard accompanied me to classes on numerous occasions. The professors kept losing their place as they kept staring at Bayard. During my senior year, Bayard passed away leaving a tremendous hole in my heart. Sukey's interest in Bassets began at an early age.